Movement in to maniples, during the 3rd century BC, called for a more independent Roman swordsman. He needed to be able to take sole responsibility of protecting himself in open combat, against more free-fighting adversaries. With the soldier’s evolution came the adaptation of his shield. The composition and components needed to acclimate to the changing tide of warfare. His shield would need to give him a new dimension of lethality while also doing its job in protecting the soldier. This need gave rise to the scutum, a simple yet effective design that the Roman Army used during the end of the republic, all the way through 300 AD. Making the scutum strong enough to take repeated sword blows, yet light enough to be carried over long journeys was a challenge. Either oak or birch constituted the body of the shield. Birch was considered because of its flexibility, while oak was utilized because of its tight grain, which made cutting through it harder (Matyszak 60-61). Three thin layers of wood were glued together at right angles. The plywood made from this process and a strip of iron or bronze around the outside gave the shield the strength it needed to protect its holder from the blows of heavy swords (Matyszak 61; Sage 71). It also kept the scutum light for long marches, at about 15 pounds (Kelly, et al.). 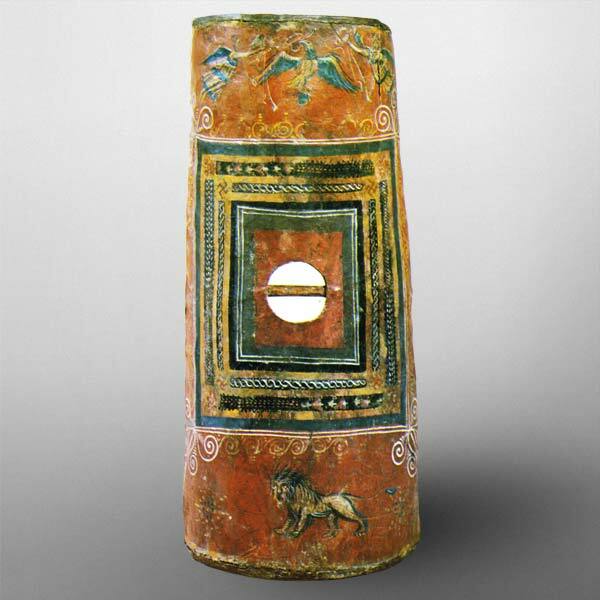 The scutum was rectangular in shape and very convex. It was built to dimensions that would better cover a soldier’s body as he was fighting. Ideally, the scutum would cover an infantryman from shoulder to knee and be wide enough so that he would not be seen when crouching behind it. This means that the shield was about 48 inches tall and close to 28 inches wide (Sage 71). So convex was this shield, that there was a 26-inch gap behind its face (Guttman). The curvature lent protection from the sides while charging and from a stationary position. With the plywood composition, this design made the scutum an amazing defensive tool. The large round hoplite shields of the phalanx had seriously limited the Roman soldier while on the offensive. The round shield had an awkward handle that made it useless for anything other than protection. Two sleek adaptations allowed a legionary to insert his shield into his offensive arsenal. One is that the handle was both horizontal, and built into the shield. When adding wooden reinforcing strips to the back, the shield maker would cut two small semi-circles in the center of the shield body. Doing this created a bar in the middle that allowed the shield to be held overhand like a suitcase handle (Matyszak 61). This grip style gave the wielder some versatility in what he did with the shield. It allowed him to bring the shield up sharply in defense against a sword. Offensively, it allowed the soldier to punch out with the shield as if it was a big fist (Matyszak 61). Legionaries often did this to knock their opponents to the ground and jab them with their sword (Kelly, et al.). Something that allowed a soldier to pack a little more punch into his wallop was the central boss of the shield. The boss was made of bronze or iron to match the metal-bound edge (Kelly, et al.). It was attached to the center of the shield over the horizontal grip to protect the hand from sword blows. Often the bosses were round or came to a point. This added to the offensive lethality of the shield (Guttman). During a punching motion, a sharp pointed boss could puncture through the armor of an enemy and kill him or leave a large open wound that would almost certainly become infected. Together, the handle and the central boss allowed a legionary to add some offense to his defense. 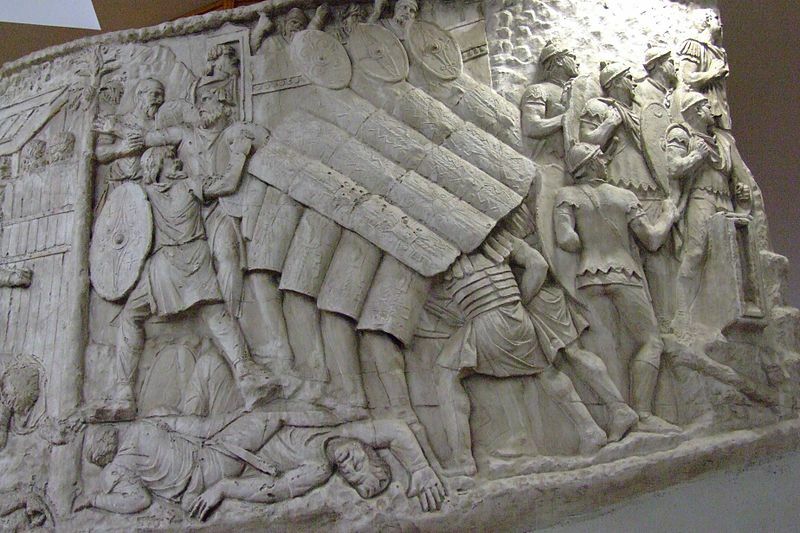 As the battlefield opened up, the Roman shield had to adapt to allow its user to survive. Maniples forced the soldier to fight more as an individual. Because of this, the scutum changed its shape and its composition. The rectangular shape and taller dimensions kept a legionary safe during the course of the battle. The special handle and the metal boss at the center helped the soldier use his scutum on the offensive. The combination of these defensive and offensive adaptations allowed the shield and the legionary to survive and thrive for many, many years. Cristian, Chirita. “Roman turtle formation on Trajan column.” Photograph. Wikimedia Commons. Wikipedia: 23 Feb. 2013. Web. 1 April 2014. Guttman, Jon. “Roman Gladius and Scutum: Carving out an Empire.” Historynet.com. Weider History Group: 13 Aug 2010. Web. 9 April 2014. Kelly, Patrick, et al. “The Shield: An Abridged History of its Use and Development.” myArmoury.com. Ed. Patrick Kelly. myArmoury.com, 2012. Web. 23 March 2014. Matyszak, Philip. Legionary: The Roman Soldier’s Unofficial Manual. London: Thames and Hudson, 2009. Print. Sage, Michael M. The Republican Roman Army: A Sourcebook. New York: Routledge, 2008. Print.